Today is the first episode in a 12-part series we’re running on the ProBlogger podcast over the next few weeks. We’re handing the podcast over to you – the listeners and readers of ProBlogger – to tell your story of how you started your blog and what’s happened since. As I said a couple of weeks ago, in the second week of January we’ll be releasing a brand new (and completely free) course on how to start a blog. And in the lead up to that we wanted to feature stories of bloggers who’ve already started. something good that’s happened since they started. 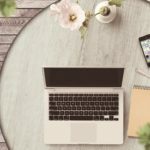 We’ve chosen bloggers from different parts of the world and different niches, and I hope you come away from this series with a little inspiration and a few practical tips to start your next blog. When we first asked for story submissions we were hoping for a handful of good stories so we could feature one a week over the next three or so weeks. But we were inundated with hundreds of them. And while I can’t feature all of them, we’ve decided to feature more than we’d planned. And in the next few weeks we’ll be rolling out 12 short episodes (16 bloggers in total). Five of those episodes will come out this week (daily shows). Then there’ll be a little break for Christmas and New Years before we roll out seven more shows over the next week and a bit. It was really hard to choose which bloggers to feature. We wanted to include a selection of different niches, objectives of blogs, and countries of origin. And of course were looking for good stories and tips. Thanks so much to those who submitted stories. We’re only featuring 16 in this series, but we do hope to use more submissions later in the year, both on this podcast and on the ProBlogger blog. I should note that not all the recordings are perfect audiowise. But they’re all under ten minutes, and despite some small imperfections in the audio we’ve chosen them because they’re good stories with good tips. So, with that all said, it’s time for our first blogger. Darren: Hey there, it’s Darren Rowse from ProBlogger. Welcome to Episode 221 of the ProBlogger podcast. ProBlogger is a blog, a podcast, event, a job board, a series of ebooks, and soon to be some courses all designed to help you as a blogger to grow your audience and to build a blog that’s profitable, as well as a blog that’s going to change the world in some way. You can learn more about ProBlogger and all we do over at problogger.com. Today is the first episode in a 12-part series that we’re running over the next few weeks here on the ProBlogger podcast where we’re handing the whole podcast over to you, listeners and readers of ProBlogger, to tell you a story of starting your blog and what’s happened since. As I said a couple of weeks ago in an episode, in the second week of January we will be releasing a brand new and completely free course on how to start a profitable blog. In the lead up to that course going live, we’ve wanted to feature some stories of you, of bloggers who’ve already started. 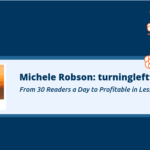 If you want to know a little bit more about the course and be notified when it does go live, just go over to problogger.com/startablog for more information on that. Over the next 12 episodes, we’re going to push them out a bit faster than normal, you’re going to hear a story in each one and in some cases you’ll hear two or three stories in the episode of bloggers who have started a blog sometime in the last 10 years. In each case they’re going to share a mistake they made, they’re going to share something that they did in the early days that they’re grateful for, they’re going to share a tip for new bloggers or bloggers of all ages really because a lot of them do go beyond that starting out, and they’re also going to share something good that happened since they started their blog. We’ve chosen bloggers from different parts of the world. You’re going to hear some different accents. You’re going to hear some Aussies, some people from India, we’ve got a French blogger, we’ve got someone living in the Caribbean. Different parts of the world but also different niches. We’ve got finance bloggers, travel bloggers, we’ve got business bloggers, we’ve got tech bloggers, all kinds of bloggers. My hope is that you’re going to come away from this series with a little bit of inspiration and a few practical tips. This is going to be particularly relevant and hopefully helpful for those of you who are thinking of starting a blog but I also hope that those of you who’ve already started will get some ideas and maybe will come away wanting to start another one. I encourage you to be open to that over the next week or so as well. Originally when we did call for submissions, we were thinking we might get ten or so submissions and we might be able to use half of them. We had no idea really how many to expect. But over the last week or so, we have been inundated with hundreds of submissions. Whilst I can’t feature all of them, we have decided to feature more than we had expected. Our team’s been working very hard. We’re going to put across 12 short episodes which will feature 16 bloggers in total. In some episodes, you’ll get two, and in one case you’ll get three stories in the episode because all of them are relatively short. Five of these episodes are going to come out this week as daily shows over the next five days. Then there’ll be a little bit of a break for Christmas and New Year before we roll out seven more shows over the next nine or so days. They’re going to come thick and fast. They are short. Hopefully over the Christmas holiday period, you will have a little bit of extra time to do some listening. It was really hard to work at which bloggers to choose to feature. We wanted to include a selection of different niches, different types of blogs, people with different objectives with their blog, people from different countries and parts of the world, and of course we’re looking for good stories and tips as well. I do want to thank those of you who submitted, those of you who we will be featuring but also the hundreds of others of you who have submitted. We do hope to feature more of them later in the year. If you submitted one and don’t hear your story featured in the next 12 or so, hopefully in the later parts of the year, you will hear yourself on the ProBlogger podcast. Also we’ll feature some of them over on the blog as well. I should say just before we get into the first story, not all of the recordings are perfect audio wise. They are all short but to spot some of those small imperfections in the audio. These are bloggers, not podcasters. We’ve chosen them because they do have good stories. I hope that you’ll bear with the little glitches in audio along the way. We just thought it was important to share them as they came out. With all that said, it’s time for our first blogger. To kick off this series of blogger stories, I’ve chosen the feature of submission by Brittany Bailey from prettyhandygirl.com. 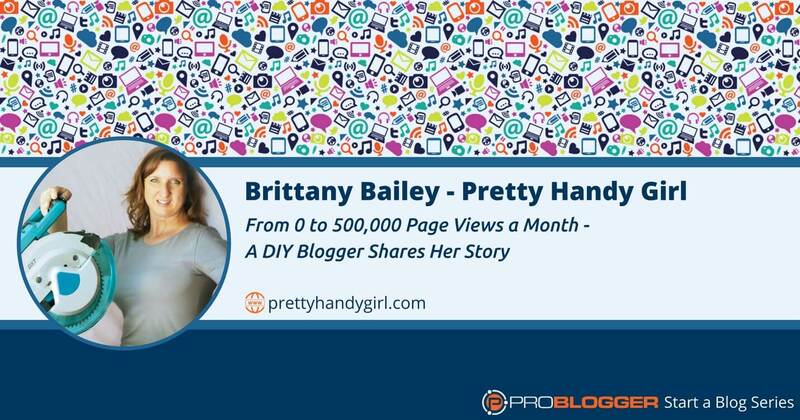 Brittany in her blog on her side bar introduces herself this way, she says, “Hi, I’m Brittany aka Pretty Handy Girl. I like the smell of coffee and sawdust in the morning. I live to break stereotypes and impel you to take on your own DIY project.” That’s what Brittany’s blog is about, DIY stuff, stuff around the house, being handy around the house. Brittany started her blog in 2010. She has grown her blog in that time too, some months having over 500,000 page views. She’s built something of significance there. She’s working with brands. She’s going to tell you a little bit more about that journey. I will come back at the end to just make a few comments on things that I like about what Brittany said. June 2010, I wrote my first blog post. I’ve been blogging ever since. My blog has grown from 0 page views to at times I’ve had over 500,000 page views a month. I’m reaching probably about 300,000 people per month. I think my husband was right, although I don’t say it often. I guess I can reach more people on the blog. I absolutely enjoy what I’m doing. I enjoy the emails that I get from my readers, especially people who are of limited finances and they might not be able to hire a plumber or an electrician so they find one of my tutorials on how to fix a toilet or how to swap out a light fixture. There are also a lot of tutorials on the website for how to do crafting and sewing projects, home improvement. It’s not just handyman-type tutorials. In hindsight, what did I do when I started my blog that I’m most grateful for? Having run two businesses before, when I started the blog I really started it as a business, not as a hobby. I knew that I wanted to be as professional as possible. I always charge for sponsored posts. I never did one for free. I always try to just maintain that professionalism when I reply to contacts, some readers, even when I wrote. I think the biggest mistake I made in the beginning was trying to do it all myself or really trying to create content just to create content. I really almost burned myself out. Luckily, I stepped back. Now, I write two posts a week and I have a contributor who writes the third post. Getting help is something that I would recommend; don’t try to do it all. Do the things that you’re good at but then hire out the things that you’re not good at. In this space, and being a blogger that has a pretty big reach has really offered me a lot of opportunities. I’ve gone on several trips to visit the headquarters of specific brands like Steel and La-Z-Boy. One of the most rewarding things that I’ve ever been able to do because of the blog is I worked on a campaign with GMC where we actually drove along the world’s longest yard sale and purchased items to furnish a habitat house. We actually were trying to scrimp and save and purchase as many items as we could for this family that was moving into their first house. That was just an extremely rewarding experience for me. I think the number one tip I have for new bloggers is start out as if you’re going to be doing this for 10 years. What do you want your brand or your company to be? Treat it like a professional and like a company. Another tip that I have for new bloggers is to not get discouraged by what everyone else is doing. One thing I’d say is that you really need to realize that every single person, every blogger that you’re reading, their blog started out with zero page views. Everyone started in the exact same space that you are. Just take your time. Learn a little something new each week and be forgiving. Thanks, Darren, for letting me submit my blog. I hope I get to talk to you in the future. If not, this again is Brittany Bailey from prettyhandygirl.com. Darren: Thanks so much Brittany for sharing your story. It was great to hear that. I hope that those of you listening find some inspiration in that. You can find a link to Brittany’s blog over on the show notes at problogger.com/podcast/221. The things I loved about that story. Firstly, I love the mistake that Brittany mentioned. She talked about creating content just to create content. This is a trap, a mistake that I think many bloggers do fall into. 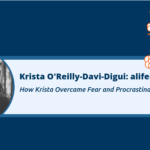 They set these expectations that, “I have to publish content every week or everyday or three times a week.” We set ourselves these deadlines, this rhythm of blogging that isn’t for good reason. It is important to have regularity to your content. But you can get to a point after a while where you do fall into that trap of just creating content because I have to create content today. As a result of that, the quality of that content can begin to suffer. There’s always this juggling act between having to publish something, you do want to be regular, but also keeping the quality up. You have to be really careful about the potential to burnout in that situation. This happens to a lot of bloggers. It doesn’t usually happen in the first month or so of blogging, those of you who are considering starting out, you usually will start with lots of enthusiasm. You’ll start with lots of ideas. But gradually over time, you will find that that is something that you bump into from time to time. I love what Brittany has done and two things that she said there. Firstly, she slowed down her content production. This is something I’ve seen a lot of bloggers do over the last year or so. I think it’s actually a smart move. We’ve done it on ProBlogger. If you’ve been listening to this podcast, you know that we have slowed down our creation of content. This is something I would encourage to those of you who’ve been blogging for a while. You are banging it up against this burnout, you’re seeing the quality of your contents slide. Consider pulling back a little bit to work on the quality of what you do. 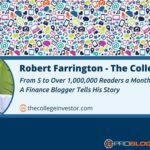 You’re going to hear a number of bloggers over the next week or so in these episodes talk about different strategies that they’ve used in this challenge. 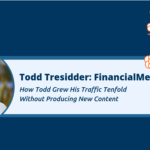 One of the things you’ll hear a number of people doing is putting less time into creating new content and more time into updating all their content. This is something that you might want to consider as well. I also like the idea there of getting some help with the content as well. This is something that I certainly did a few years ago now to actually bring someone on to lighten the load a little bit with that content creation, whether that be helping you with proofreading and editing or whether that be actually adding a new voice into your blog and doing some writing as well. Great tips there from Brittany. I also love the tip that she said, “Start out as if you’re going to be doing this for 10 years. 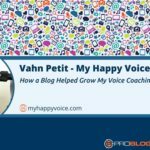 Treat your blog that way.” I think that’s brilliant advice. You’re going to hear that same advice later on in this series from one other person. I’ve seen this time and time again. It’s the bloggers who decide to treat their blog as a business today rather than as a business one day. They’re people who have this idea of where they’re heading. They begin to act in that professional way today even though their blog hasn’t reached that business level. They’re the ones who seem to grow faster. I love that advice from Brittany. Try to visualize where your blog might be going. The chances are your blog is going to evolve in a different way to what you think it will. But treat it as if it is going to become a business. Treat it in a professional way in the early days. It doesn’t have to turn out exactly the way that you visualize it. By treating it in that professional way, by having a vision for your blog, it impacts the way you act in the day to day. That helps you to grow it faster, it helps you to attract new advertisers, to think about new revenue streams, and those types of things as well. Even if you’re just starting out, remember this series is for those of you who are just starting out, treat it with that expectation that’s going to turn into something bigger than that. Treat it that way. Lastly, that advice from Brittany, just bring it for new bloggers particularly. Don’t be discouraged by what other people are doing. Everyone starts out with 0 page views. That is so true. I remember that day in 2002 when I started my blog and I wrote my first blog post. I realized the only person who knew it existed was me. And then I spanned a couple of my friends and got them to look at it. They were my first page views. We all start that way with us as our own first reader and then few people in our real life. That’s how we all start. You will look at other blogs and you’ll think, “Oh, wow. They’re amazing.” Yes they might be amazing but they all started out in that same way, with the same doubts and the same insecurities that we all start our blogs with. If you’re starting out, don’t be discouraged by that. Learn something new every week as Brittany suggests. Hopefully our Start a Blog course is going to help you to do that. If you’re thinking of starting a blog, head over to problogger.com/startablog. We will send you an email with details when this new course goes live. It will go live in the second week of January. All things are going well. It’s completely free. Whether you’re starting a first blog or whether you are starting a second or a third blog, we want to teach you some principles. Just help you to start a blog with good foundations. Thanks so much, Brittany. You can find Brittany on her blog over at prettyhandygirl.com. All the details of our course and all of the other things going on at ProBlogger over at problogger.com/podcast/221 where there’s also a transcript of today’s show. As I said earlier, this is going to be a daily show for the next week or so. Then over the next couple of weeks, you’ll hear 12 or so episodes on this series. Watch out for the podcast. They’re all going to be fairly short. This is probably the longest of them all because I had to introduce the concept. But I hope you get a lot of value from them. Thanks for listening. Chat with you tomorrow. The post 221: From 0 to 500,000 Page Views a Month – A DIY Blogger Shares Her Story appeared first on ProBlogger.